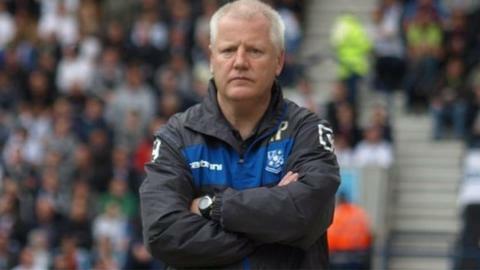 Tranmere Rovers have parted company with manager Les Parry, after over two years in charge at Prenton Park. Rovers lost 1-0 at fellow League One strugglers Chesterfield on Saturday, a result that extended their winless run to 11 matches. The run has seen Tranmere slip to 19th in League One, just one point and two places above the relegation zone. Former physiotherapist Parry took charge in October 2009 following the departure of John Barnes. Parry's association with the Merseyside club goes back to 1991, and after replacing Barnes initially on a temporary basis he was given the job permanently in December 2009. This season began brightly with three victories in the first five league matches but the team's form has dipped and they are without a win since December. Parry said: "I have been in the game long enough to know I was on a sticky wicket with the way results have been going. "I wanted to carry on. I have got us out of this kind of situation on two occasions before. In fact we were in a worse position than this in the last two seasons and I would would like to have done it a third time. "I wish Tranmere every success, they will always be in my heart."